The way you eat can be associated with your lifestyle, moral beliefs, how you train, and even your economical status. The bottom line is that we need nutritious foods for health, and to thrive physically, mentally and emotionally. Today we will review the difference between a traditional meat eating diet verses a vegetarian and vegan diet. Traditional diet- A diet plan that incorporates all foods groups into meals and snacks including all natural animal products from meat, poultry, seafood, pork, eggs, dairy, in addition to fats from nuts, seeds, oils, in addition to fruits, vegetables. This diet is not restrictive and can be thought of as a traditional American diet. 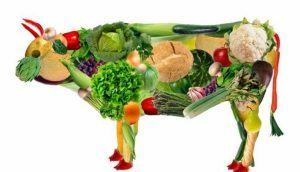 Vegetarian diet is a diet that does not include meat, and sometimes other animal products, especially for moral, religious, or health reasons. Some vegetarians do eat some seafood, eggs and dairy. Less than 1% of Americans use a vegetarian diet. Vegan diet is a diet that does not include any animal products. Typically vegans do not use any products for cosmetic purposes either. Less than 1/2% of Americans use a vegan diet. Possible nutrient deficiencies can occur without consumption of animal products. A well-planned vegetarian diet can be adequate in protein and most other essential nutrients, but vitamin B-12 is a nutrient that is only naturally in animal-based foods, such as meat, poultry, fish, eggs and dairy products. They need to obtain vitamin B-12 from fortified foods or supplements, this can be difficult to get adequate levels. Vegan diets can include calcium from fortified sources, such as fortified orange juice and soy milk, but these also contain excess sugar and soy has other health risk associated with its consumption such as hormone imbalance and increased cancer risk. Vegans also miss out on the omega-3 fats found in fatty fish. Walnuts and flaxseed provide omega-3 fatty acids, but supplements can provide additional heart-healthy benefits to make up for the lack of seafood in the diet. The omegas in plant-based sources are not as potent as the cold-water fish sources like salmon or sardines. They assume that there are automatic health benefits if they simply eliminate animal products. Despite the potential health benefits of vegetarian diets, these results are not automatic. They are more likely when you mainly choose healthy foods, such as unprocessed whole grains, fruits, vegetables, nuts, beans and seeds. Vegetarian diets that rely on refined grains, sweets, sugar-sweetened beverages and solid fats can be just as unhealthy as diets that include meat. French fries, doughnuts and snack cakes, for example, are vegetarian, but they can contain dangerous trans fats, which raise your unhealthy LDL cholesterol and lower your levels of high-density lipoprotein, or “good” cholesterol. There are several vegetarians who struggle with their weight because they have insulin levels that fluctuate from excessive carbohydrate intake. The person must be educated on how to obtain proper amounts of essential amino acids, protein and healthy fats from plant based foods, often times this requires a protein powder supplement. Soy was once thought of as one of the best and most healthy foods available. We have been misinformed from several different angles. Research suggest that soy is linked to malnutrition, digestive distress, immune system breakdown, thyroid dysfunction, cognitive decline, reproductive disorders and even increased risk for cancer and heart disease. 90 percent of the soybeans grown in the United States are genetically modified, this is the number one reason they should be avoided. Since the introduction of genetically engineered foods in 1996, we’ve had an upsurge in low birth weight babies, infertility, and other problems in the U.S., and animal studies have shown devastating effects from genetically modified soy including allergies, sterility, birth defects, and offspring death rates up to five times higher than normal. Soybean crops are also heavily sprayed with chemical herbicides, which other countries have banned due the fact that they are carcinogens. Soybeans- even high-end organically grown soybeans — naturally contain “antinutrients” such as saponins, soyatoxin, phytates, trypsin inhibitors, goitrogens and phytoestrogens. Traditional fermentation destroys these antinutrients, which allows your body to enjoy soy’s nutritional benefits. However, most Westerners do not consume fermented soy, but rather unfermented soy, mostly in the form of soymilk, tofu, TVP, and soy infant formula. This is what is available to us in the main isles of the grocery store. High Phytic Acid (Phytates):Reduces assimilation of calcium, magnesium, copper, iron and zinc. Phytic acid in soy is not neutralized by ordinary preparation methods such as soaking, sprouting and long, slow cooking, but only with long fermentation. High-phytate diets have caused growth problems in children. Trypsin inhibitors:Interferes with protein digestion and may cause pancreatic disorders. In test animals, trypsin inhibitors in soy caused stunted growth. Goitrogens:Potent agents that block your synthesis of thyroid hormones and can cause hypothyroidism and thyroid cancer. In infants, consumption of soy formula has been linked with autoimmune thyroid disease. Goitrogens interfere with iodine metabolism. Phytoestrogens/Isoflavones:Plant compounds resembling human estrogen can block your normal estrogen and disrupt endocrine function, cause infertility, and increase your risk for breast cancer. Hemagglutinin:A clot-promoting substance that causes your red blood cells to clump, making them unable to properly absorb and distribute oxygen to your tissues. Synthetic Vitamin D:Soy foods increase your body’s vitamin D requirement, which is why companies add synthetic vitamin D2 to soymilk (a toxic form of vitamin D). Protein Denaturing: Fragile proteins are denatured during high temperature processing to make soy protein isolate and textured vegetable protein (TVP). Chemical processing of soy protein results in the formation of toxic lysinoalanine and highly carcinogenic nitrosamines. MSG:Free glutamic acid, or MSG, is a potent neurotoxin. MSG is formed during soy food processing, plus additional MSG is often added to mask soy’s unpleasant taste. Aluminum and Manganese:Soy foods contain high levels of aluminum, which is toxic to your nervous system and kidneys, and manganese, which wreaks havoc on your baby’s immature metabolic system. Soy’s antinutrients are quite potent. Drinking just two glasses of soymilk daily provides enough of these compounds to alter a woman’s menstrual cycle. But if you feed soy to your infant or child, these effects are magnified a thousand-fold. Infants fed soy formula may have up to 20,000 times more estrogen circulating through their bodies as those fed other formulas. Think twice and do more research on non-soy alternatives for formula if this is a concern for you. Fermented soy is the only healthy option for soy consumption. Fermented soy is a great source of vitamin K2, and K2 (combined with vitamin D) is essential in preventing osteoporosis, cardiovascular disease, dementia, and various types of cancer. Nutrients only obtained from animal sources. Vitamin B12 is an essential nutrient found in virtually no plant foods, the exceptions include seaweed in small amounts. Also known as cobalamin, vitamin B12 is a water-soluble nutrient involved in the development of red blood cells, maintenance of nerves and normal brain function. Without supplements or enriched foods, vegetarians are at a high risk of vitamin B12 deficiency. It is mainly found in animal foods, such as fish, meat, dairy products and eggs. Lacto-ovo vegetarians can get adequate amounts of vitamin B12 from dairy products and eggs, but this is much more challenging for vegans. For this reason, vegans are at a higher risk of vitamin B12 deficiency than some vegetarians. Creatine is a bioactive compound found in animal foods, it specifically helps with brain and muscle function. Most of it is stored in muscles, but significant amounts are also concentrated in the brain. It functions as an easily accessible energy reserve for muscle cells, giving them greater strength and endurance. Creatine is not essential in the diet, since the liver can produce it. However, vegetarians have lower amounts of creatine in their muscles. It is important for normal brain development and function. Deficiency in DHA can have adverse effects on mental health and brain function, especially in children. In addition, inadequate DHA intake in pregnant women may adversely affect brain development in the child. However, the conversion of ALA to DHA is inefficient. For this reason, vegetarians and vegans are often lower in DHA than meat eaters. A balanced diet rich in vegetables, some fruits, and quality all natural protein, and healthy fats is a simple way to ensure that all of your nutritional needs are met without creating any nutrition deficiencies. If the only appeal of a vegetarian/vegan diet is weight loss and you could care less about the religious and moral aspects of the lifestyle then keep the all-natural animal products coming. Look for quality all natural animal products that are free of hormones, preservatives, antibiotics and dyes. Consuming at .8-1.0 grams of protein per pound of your goal body weight is a great way to meet your needs and health goals.